Butler Park is located right behind the Dougherty Arts Center and next to the Palmer Events Center. The highlight of this park is the large oval fountains that splash in differing heights and duration. 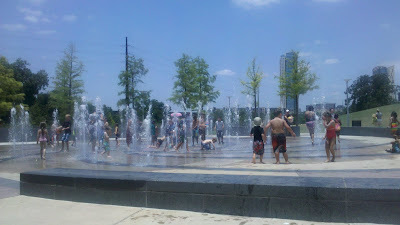 Next to the fountains is a 35 foot high observation hill overlooking Lady Bird Lake. This is a great place to grab a good snapshot of our beautiful city… or roll down! Also on site is a small pond with turtles and fish. Take a break from the fountains to enjoy this area. There is a small concrete pad that is perfect for the kids to wade into and catch minnows! Our visitThis is another family favorite of the last few years, and one we might visit again before summer's end. This time, we went during the day, but I'd like to revisit it toward the end of summer so we can check out the evening laser show. The boys always love splashing in the fountains, with brief breaks to roll down the nearby hill. And it is amazing how cooling the spray can be on a very hot day. My favorite part of this whole park is the skyline of Austin in the background. Although I know that we live in a big city, I am usually outside of the city, or downtown. Rarely do I get the close-up skyline view, and I really love it!